She had a huge footprint, one that covered nearly a quarter mile. She was built using funds that were contributed by Philadelphians in a special war bond drive in 1945. In fact, more than $7 million of her $76 million price tag came from school children. 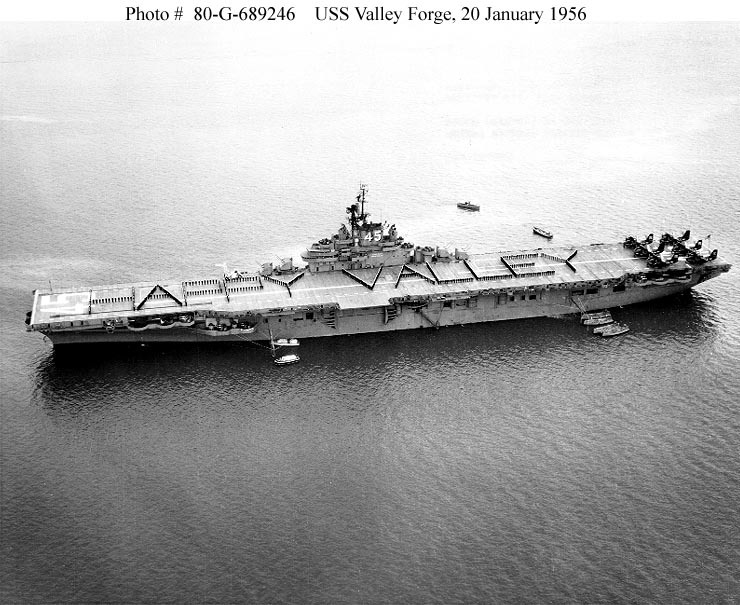 The 1946 commission of this vessel marked her with a name that spoke of confidence, courage and a fighting spirit: The USS Valley Forge. After her construction at the Philadelphia Navy Yard, the 36,000-ton behemoth sailed through the Panama Canal and took up residence at her home port of San Diego, CA. She remained active during both the Korean and Vietnam wars, remaining in the fleet until 1970. This Veteran&apos;s Day, several of her former crew members remember their time onboard. "I stepped onto the Valley Forge on December 10, 1967," says James Watts of Houston, who enlisted directly out of high school. One of his first jobs at sea was a 90-day stint as a mess cook. "From 4 a.m. to 7:30 p.m., we fed three meals a day to 5,000 sailors and marines." He eventually rose to the position of Mess Cook Yeoman, which garnered him an onboard office. Among his perks was "...a turntable with more than 30 albums to play." The position suited him: "It was the best job on the whole ship except for the captain and other officers," he recalls. He extended his term of service an additional three months. John Cline - now from Rice Lake, WI - served in an electronic technician group, where he specialized in radar. He recalls going to shore "several times to give a sonic cleaning to electronic gear." He also was flown to a hospital ship to work on its radar. Cline&apos;s time aboard the Valley Forge coincided with the recommission and redeploy of the USS New Jersey. He remembers seeing a demonstration of its powerful armaments: "When the New Jersey fired all her guns broadside, it moved her back in the water seven feet." Legal officer aboard the Valley Forge was Harold DuBois of Baltimore, MD. "I was 23 years old and had finished pre-law," he says. "I knew I was going to be drafted, but I wanted a choice in the branch of the service I would be assigned to. I saw a magazine with an ad showing two naval officers walking down the beach in Hawaii, wearing these hats. The other page showed a couple of soldiers in a foxhole, slopping through the mud and eating out of cans. So back to the two officers on the beach, I thought, ‘That looks pretty good.&apos;"
DuBois picked up the ship out of Norfolk, Va., and went through the Panama Canal. "On the way through - she was one of the first aircraft carriers that ever went through - the flight deck knocked over a lot of structures that were very close. But we got through," he recollects. When the ship docked at the Subic Bay Naval Base in the Philippians, DuBois&apos; role included enforcing curfew for crewmembers on leave. "At night, there was a curfew of 11 o&apos;clock, to make sure the sailors got back onboard the ship. I used to have to stay to maybe 12, 1 o&apos;clock every night. Every once in a while, I had to walk around to all the nightclubs to see if all the sailors were out of there." Throughout 1969, the Valley Forge continued to serve helicopter support for the military engagements in Vietnam, specifically in Danang. In August 1969, she set sail for Hong Kong to avoid an approaching typhoon. She dropped anchor there for three days, during which the orders came down: The Valley Forge would be decommissioned. On September 22, 1969, she pulled into Long Beach and, after a few short jaunts to deliver offloaded supplies, underwent the months-long process of being mothballed. One final excursion took her to San Diego, where she was formally removed from the Navy&apos;s list of active vessels on January 15, 1970. One additional adventure awaited: The interior of the inactive aircraft carrier was used as a filming location for the sci-fi film Silent Running, starring Bruce Dern. A fundraising effort was begun, with the intent of turning the USS Valley Forge into a museum. 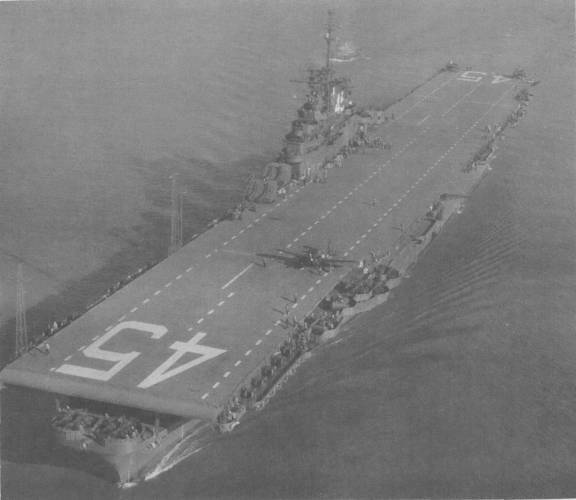 But when sufficient support failed to emerge, she was sold for scrap on October 29, 1971. Her record, however lives on: The ship was awarded eight battle stars for Korean War service and nine for Vietnam service, as well as three Navy Unit Commendations. DuBois&apos; time onboard eventually led him to visit the site that served as the ship&apos;s namesake. "I got to see the preserved buildings and artifacts at Valley Forge Park, the things that go back to when George Washington was there" he says. "It&apos;s really pretty amazing, the things from the Revolution that are still around." Those treasures of Valley Forge include the military personnel who served aboard its decks as she plied the seas in combat. This Veterans Day, we recognize the commitment of all her crew, including seamen Watts, Cline and DuBois. 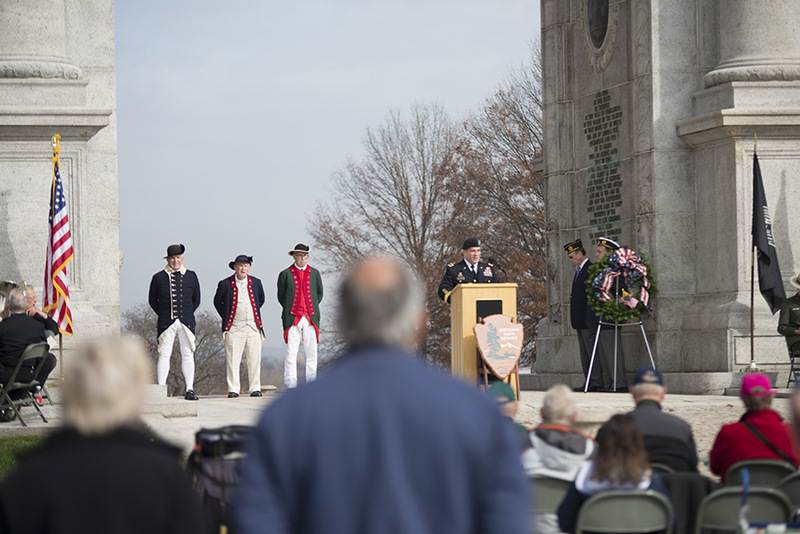 The National Park Service will be joined by local and national military organizations to honor our nation&apos;s heroes through traditional ceremonial services. Guest speakers Park Ranger, Bob Donnelly and Kevin Ferris, author of Unbreakable Bonds: The Mighty Moms and Wounded Warriors of Walter Reed share stories about Veterans and their return home. Concluding the event, an Oath of Enlistment Ceremony will induct several new recruits into the United States Military. 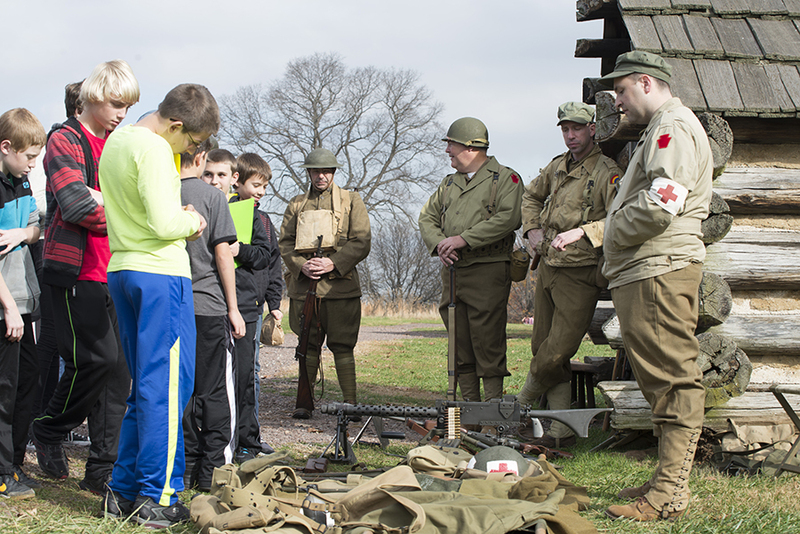 Park staff, volunteers, and veterans present America&apos;s military history from the perspectives of a variety of conflicts that include the Revolutionary, Civil and Vietnam Wars. Ranger-led Walking Tours: 12:20 p.m. and 2:20 p.m.
Meet outside the Park Theater and walk the quarter mile to Muhlenberg Brigade Huts for a 40-minute tour.